A dignified roots vocal that represents the sounds of the Wailers of the time. In the 60’s, as known as the prime of time for Rocksteady, Jimmy Riley used to sing for a vocal group called the Uniques. 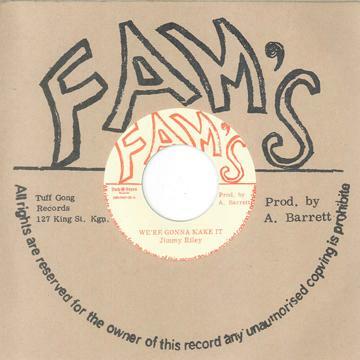 Back then, Familyman was playing as a part of the infamous session band, the Hippy Boys in the heart of Kingston.The first ever recording of those two goes way back in 1968, so it must have been quite a reunion in this studio session.This piece was recorded around about the same time as the Cobra Style, and exactly as Familyman plotted, the veteran, Jimmy achieved the great Wailers sound. In the 60’s, as known as the prime of time for Rocksteady, Jimmy Riley used to sing for a vocal group called the Uniques. Back then, Familyman was playing as a part of the infamous session band, the Hippy Boys in the heart of Kingston.The first ever recording of those two goes way back in 1968, so it must have been quite a reunion in this studio session.This piece was recorded around about the same time as the Cobra Style, and exactly as Familyman plotted, the veteran, Jimmy achieved the great Wailers sound. No.2 at Total Ranking on Oct 28, 2014. No.2 at Genre Ranking on Sep 8, 2015. No.2 at Format Ranking on Sep 8, 2015.